Bulk SMS Mobile Marketing Software for Pocket PC is useful to compose and send instant bulk text messages from Microsoft Windows based pocket pc devices to group of other mobile phone numbers in one click. Pocket PC bulk sms software is used to send thousands of personalized or commercial short text messages without use of hard ware device or any internet connectivity. Bulk sms is useful to send group sms from all major Microsoft Windows based Pocket PC devices. Send sms from pocket PC devices to group of other mobile phone numbers in one click. Simple bulk mobile phone sms sending procedure. No internet connectivity required while sending group sms messages. 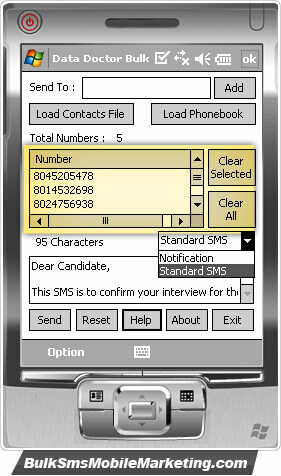 Download demo to evaluate software sms sending process. Provides user – friendly Pocket PC to Mobile Bulk SMS software GUI interface.